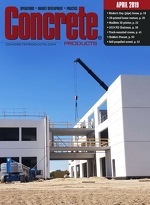 Fairless Hills, Pa., precast concrete accessories manufacturer and distributor A.L. Patterson Inc. has closed on New Nycon Inc., rebranding the business Nycon Corp. and positioning it for sales, marketing and distribution efficiencies with affiliated companies Vandex-USA and Cast Supply. Patterson chief Barry Fleck is Nycon president, Paul Bracegirdle vice president. The business will further leverage Patterson's depth of product offerings to precast and precast/prestressed concrete producers. The deal coincides with a new license enabling Nycon Corp. to offer Nycon-G eco-friendly concrete- and asphalt-reinforcing fibers. Nycon-G joins a line of nylon, polypropylene, AT and E glass, steel, basalt, and blended fibers.